Apple is aware of this curious bug and will apparently offer a bug fix software update to resolve the problem. But in the meantime, Apple also offers a workaround solution using the text replacement feature of iOS. Update: Apple has released iOS 11.1.1 as a bug fix for this issue, Go to Settings > General > Software Update to download iOS 11.1.1 and fix the problem. Why am I seeing question mark boxes on iPhone or iPad?? The reason many people are seeing question mark boxes in iOS either when typing or when reading other peoples emails, texts, tweets, social media posts, or otherwise, is because of a bug in iOS. Apple is aware of the question mark box bug and is said to be issuing a bug fix update in the future to address the problem. In the meantime, the instructions below detail how you can work around the autocorrect question mark boxes bug. Now when you type “i” it should actually type “i” rather than the A box character curiosity. This solution, which is very much a workaround, is what Apple suggests as a fix for the problem until a future software update resolves the bug. This is a strange bug and it does not impact every iPhone or iPad user with the iOS 11.1 release. Nonetheless we can expect a software update to fix the problem fairly shortly, perhaps as a small update like iOS 11.1.1 or similar. If you’re impacted by this bug, use the text replacement workaround for the time being, and be sure to update your iOS version when a new release comes out. I have a similar problem with the letter “a”. I use both English and greek keyboards. In iPad as well as iPhone when I type latin “a” it comes out as a Greek “α”. This started after the latest update (11.1). Do you have an idea of how to fix it? What you describe is likely part of the same bug in iOS 11.1. Your best bet would be to create another text replacement shortcut for “a” to be “a”. These are just workarounds until a bug release update arrives, which hopefully will be soon. 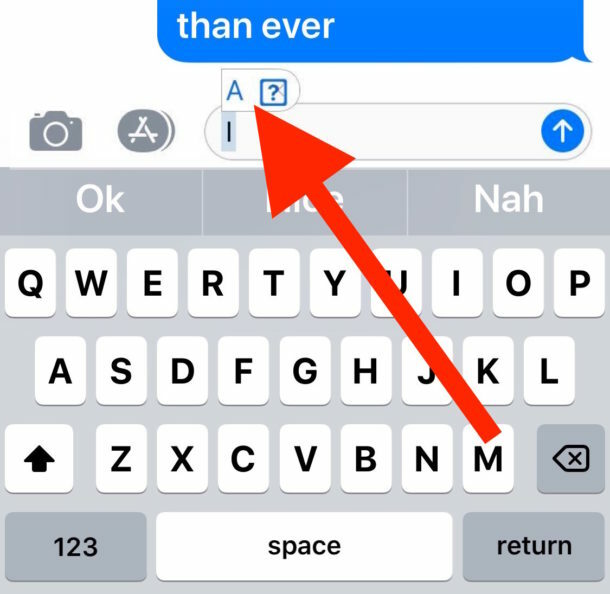 If you use the shortcut illustrated you will get a capital I, not a lower case i.
Alternately voicing an I️ …. ( I ) works. This iPhone 7 is so buggy I’m missing my 6. As you said, this problem is not universal. It does not affect our iPhone 6, iPhone 7, iPad Air 2 or iPad Air Pro. All running iOS 11.1. We live in the UK if that is at all relevant. It used to be updates were only for bug fixes. Now they’re mostly for business model changes, UI experiments, and apparently buggy technical tests forced upon users. Is there a way to only get bug fixes or have they successfully integrated the unwanted changes with the actual necessary fixes? This happens on my MacBook prop message also not just my iPhone. Is there a workaround for the MacBook Pro? I’m already on IOS 11.1.1, and this issue JUST started on my iPad. ANNOYING!!!! Please FIX!!! I am also seeing it on iOS 11.1.1 and iOS 11.1.2 as well as iOS 11.2, so the bug still exists somehow. Seeing those question marks everywhere online too, it is impacting a huge amount of people. It makes me think it is on Apple side now with Autocorrect. After a year or two of flawless operation, the screen keyboard on my 12-inch iPad Pro is flakey. No response to two or three key strokes mainly. Or perhaps it’s the touch screen, because moving objects in games is flakey, too. Getting a Scrabble tile to the right place can take several attempts.